From “Tour of Waterfalls in Various Provinces”. In a waterfall at the Afuri Shrine, which is dedicated to the deity responsible for sending rain, pilgrims with wooden “prayer boards” are conducting a purification ritual. On the cloak of the pilgrim on the left and on the pilgrims’ hats at the guesthouse on the right, the logo and individual characters of the publishing house Eijudō can be recognized. Pilgrims from Edo had been visiting this site since the early 18th century. 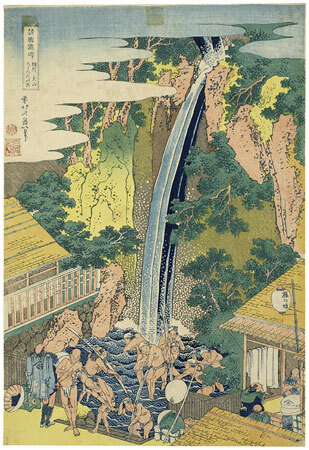 This and the three following prints are from a series of eight views of waterfalls published by Eijudō in the early 1830s. Ōyama, in Kanagawa Prefecture, not far from Edo, was the site of the Afuri Shrine which was dedicated to a rain-making god. It held an annual festival every year beginning on the 26th day of the sixth month and ending on the 17th day of the seventh month of the lunar calendar, during the height of summer. Pilgrims, who had already purified themselves with a ritual ablution at Ryōgoku in Edo on the 5th day of the fifth month, dressed in white robes, gathered themselves into companies, and marched to the mountain, blowing conch shells. At the mountain they were required to purify themselves again by bathing in a rock-surrounded pool beneath a waterfall named after the 8th century priest Rōben, one of the founders of the Kegon sect of Buddhism. Failure to bathe in the pool below the waterfall would allow the tengu, long-nosed demons who inhabited the mountain, to tear the impure pilgrims to pieces as they continued their ascent. After bathing, the pilgrims continued their climb carrying the large, inscribed wooden swords that they left around the main image when they reached the shrine on the mountain top. In Hokusai’s picture we see the pilgrims clutching their wooden swords and shivering in the cold spray of the waterfall. Pilgrimages were made to Ōyama as early as the 1710s, but the visit was not popular until the 1760s when it became a subject for poetry and drama. There may have been a particular revival of interest in the shrine in the early 1830s because Kuniyoshi also designed two horizontal ôban and two triptychs of pilgrims bathing in the waterfall. The lantern at the right is inscribed Fuji no Bō, “Wisteria Building”. Various emblems of the publisher Eijudō are visible on the pilgrims’ hats and on the jacket of the man standing at the left. This is a particularly fine impression, showing the contrast between the cool blues of the water and the warm greens and yellows of the architecture and foliage that Hokusai so frequently used in his prints. Reproduced in: Ingelheim catalogue, no. 111.